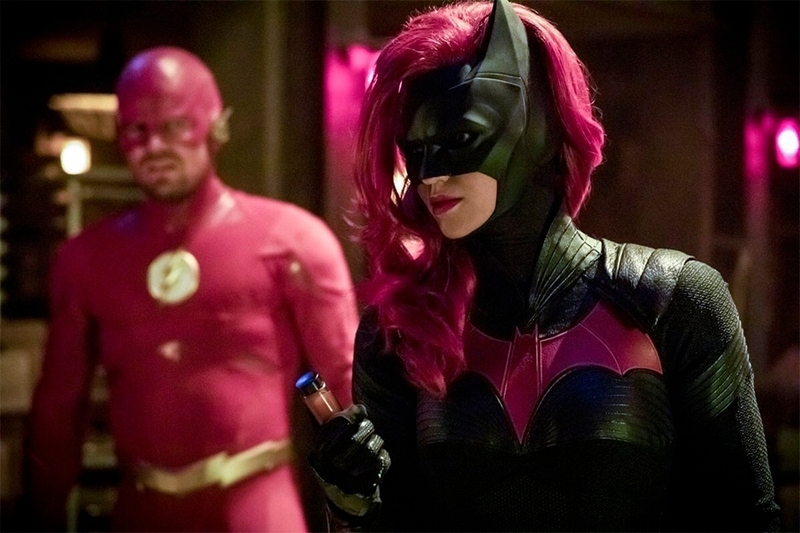 Next month’s big Arrowverse crossover, “Elseworlds,” will at long last bring us the debut of Batwoman in The CW’s DC universe, as played by Orange is the New Black star Ruby Rose. Obviously, fans are eager to see the Gotham City heroine appear on our screens in her first ever live-action portrayal and, from the posters and images we’ve been treated to so far, the character looks like she’s leaped straight out of the comics. At the moment, we’re still not sure exactly how Kate Kane will factor into the event, but in The CW’s version of Gotham City, it’s been said that Batman’s been absent for several years, which is why Kate will need to step up and protect the place. That’ll no doubt put her on course to meet Ollie, Barry and Kara, and ahead of her grand introduction this December, we now have another photo to feast on. Seen in the gallery below, the context of what’s happening here is unclear, but you can clearly see Oliver Queen dressed as The Flash in the background, which only has us that much more excited to finally watch the two heroes interact with one another. This fall’s Arrowverse crossover – Batwoman and all – gets underway on Sunday, December 9 with The Flash, continues on Monday, December 10 with Arrow, and wraps up on Tuesday, December 11 with Supergirl.